Julian Stubbs, and other members of UP THERE, EVERYWHERE regularly perform brand workshops for companies who are going through changes or need to refresh their brand image. Start Me UP Brand Workshops are an effective tool not only to develop sound brand and communications strategies, but also to help gain employee involvement in developing the brand messaging. Brand workshops are also an effective way to get the marketing team re-energized about the product message and brand image. What are Start Me UP Brand Workshops? Start me UP Brand workshops are a single or series of small group sessions that get internal audiences and stake-holders to participate in developing and honing the brand positioning, brand message, brand image and brand strategy. They include thought-provoking presentations, brainstorming sessions and creative exercises that get the participants really thinking. They are intensive, collaborative, explorative — and always fun. 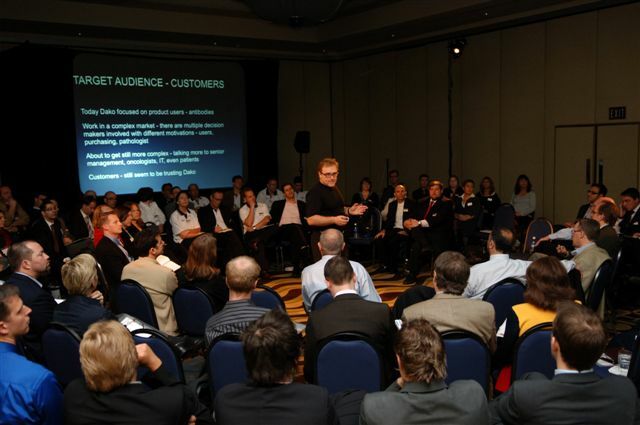 Julian Stubbs and UP THERE, EVERYWHERE conduct a number of different types of brand workshops designed to meet each client’s specific needs. From multi-session brand engagement workshops, to brand planning, to single session brand strategy input sessions, brand workshops help a company focus on core brand values and gather input from all levels. Workshops can include primarily company leaders or a cross-section of all internal audiences across functions and geography worldwide. Changes in company structure. New owners or mergers. Launching new product or division. Expanding into new markets, regions or countries. Competition has become fierce or market share is slipping. Changes in brand strategy or product line. Have neglected brand strategy for several years, or team has become complacent. Group branding exercises. Get people involved in the branding work and let them speak their mind. This produces better brands and strategy buy-in. Existing communications review. What is good/bad. What works/doesn’t work. Brand training. Education for staff on the brand. Brand Engagement. Selling in and helping build the brand internally. For more information on branding workshops, contact Julian Stubbs.